We will start with an introduction to the tools and materials. You will get your own tool kit including a set of felting needles to take home. In the morning we will make a simple Lincoln Longwool sheep and in the afternoon move onto a more intricate cute little fox. 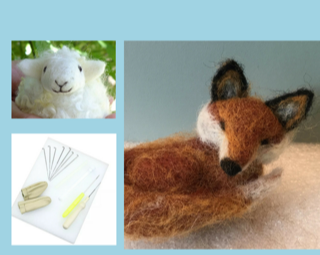 We will include enough supplies to make a second sheep and fox at home! You can either bring a packed lunch with you or we can order in for you on the day. You will leave confident (addicted 😉 and ready to take on any needle felt project that takes your fancy.